Two boxing brothers will be bringing festive cheer to the borough when they officially turn on the Christmas lights of a care home. Twins Jamie and Gavin McDonnell will be the guests of honour at the Brightening Up The Local Community ceremony at Anchor’s Hatfield House in Crooks Broom Avenue, Hatfield, on Thursday, December 6. Jamie is the former IBF World Bantamweight Champion, while his brother Gavin is a former British Super-Bantamweight champion. Manager of Hatfield House, Mark Hague, said the residents love Christmas and the ceremony would be a great start to the festivities at the home. He said: “Anchor’s care homes across the country will be inviting members of the public to their switching on the lights ceremonies as part of our national campaign to brighten up our local communities. “Christmas is such an time for our residents and they enjoy all the festivities, especially getting round the tree to sing carols. One resident who is particularly looking forward to the boxing brothers’ visit is Bill Taylor, aged 93, who has lived at Hatfield House since October 2016. Hatfield House will be among Anchor’s 118 care homes across the country who will be switching on their Christmas lights on December 6 to officially launch the festive season. 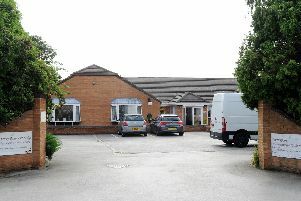 Residents will then have a singalong with an entertainer followed by a buffet tea. For more information on Hatfield House care home, please call 01302 844 889.